Eventually, there’s a list of rules, and it looks much like EVERY classroom’s list of rules. It was “student generated” though, so they will be committed to these rules, right? Let’s take another example. At work, we’re forming a new partnership, and we start by discussing, “What is our shared goal?” Then we spend time considering how we can best reach the goal — and then jot a few agreements about how we’ll work together in this partnership. We pass this back and forth a few times, and decide maybe we even sign it. Does this feel different to you? I suspect we’re often confused about the difference between “Rules” and “Agreements,” and this confusion has a significant impact on motivation. Rules are imposed. They’re set for the purpose of compliance. Transgressions should be punished to maintain the power of the rule. Rules are “above people.” The locus of control is external, teaching us that we don’t have the power – so we’re pushed toward obedience rather than internal motivation. Agreements are negotiated. They’re set for the purpose of collaboration. Transgressions should be discussed to learn. Agreements are “between people.” The locus of control is internal, teaching us that we have the power – so we’re pushed toward intrinsic motivation. Let’s return to the question of the goal. Is this list in place so we can learn, individually and together? Or is it in place so we have order? Compliance? Safety or the perception of safety? The illusion of respect or real respect? What happens when there is a transgression? Is that an opportunity to reinforce the rule and show it’s seriousness? Or is it an opportunity for learning? 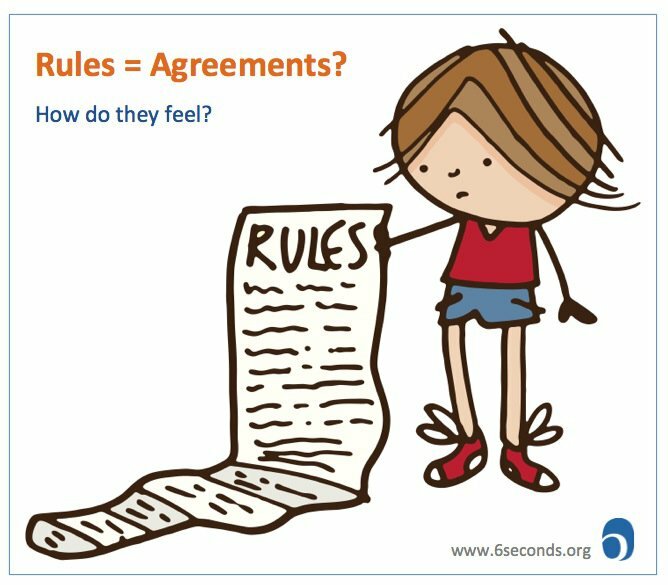 What would happen in your office, classroom, or family if you replaced many of your Rules with Agreements? Probably it would take more time at the outset – would this investment pay off? What’s the emotional affect? I agree with you that creating opportunities for a class to negotiate classroom agreements is much more effective than imposing class “rules” that are focused on compliance. A wonderful activity that we practice at the beginning of our EQ Educator certification course is called “the Being.” I first learned this at Project Adventure, and have used it in many different settings –it’s an engaging, visual and kinesthetic way to create a group agreement. Participants draw an outline of a body (often tracing around a group member volunteer) or they can choose a group symbol and draw that. Everyone fills the inside with words representing those values, attitudes, and strategies that they would like to see “in” the classroom to create an atmosphere that would best help them to learn and to feel included. Outside of the body outline or symbol, participants write those things they want to “keep out” of the group. As you noted above, Josh, agreements, as opposed to rules, are modifiable, and we revisit them, and see how well they’re working and what some of the challenges are. The Being is a living document which hangs in the classroom and is continually referred to during group check-ins and when issues arise. Collaboration is needed to work together, creating the Being outline, listening and including others, even sharing markers, and taking turns filling in the words, so the “Process is the Content” — one of the tenets of Six Seconds’ learning philosophy. Josh :This is such a good topic for discussion and introspection. i suspect we actually pretend to have “Agreements” but reinforce as “Rules”. Though often not consciously. Nice that you have brought this difference to the conscious level. It shall make a difference when I next hold my training sessions. Susan : I really like what you call “The Being” – a living document. Are’nt we all ? How wonderful ! Did this recently on my own (synchronistically). I have been facilitating discussions of results of OVS assessments with groups not used to conversing on such (emotional) topics. Near the beginning I ask the group to decide how they would like the conversation to proceed. Used to ask them to come up with their own ground rules for their discussion. Generally not a problem as most people understand the purpose of groundrules……………but I thought I’d approach it differently and asked them to come up with some agreements on how they wanted the conversation to proceed. In this case, I’m not sure it made a huge difference, but it felt like the right direction to go. This is a great one! It made me, as a teacher and colleague, think. Thanks, Josh. Thank you Joshua for bringing this up. This will be a good piece info for me to share around as a trainer in the making. In our context of training, we call this a ‘team charter’, and the team gets to decide what values and behaviours are acceptable, and what are not. This is powerful in that it seeks buy-in from the team members, and is not imposed by an external party. This creates an ownership for the agreement, but importantly also the problems which arise in conflict with what the team has agreed on. They then have the responsibility to look into the problem and review their own behaviours.